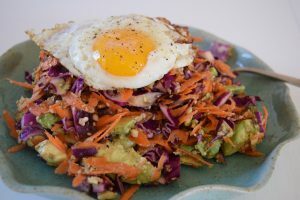 I can’t believe it has taken me this long to add a slaw recipe to my site. Although I did make this video a couple of years back. It is probably the side dish I reach for most, and often becomes the base of my lunch or dinner. I think the reason I’ve never added it before is because I so rarely make it the same way twice. So many of you have asked for a recipe though so here we go. 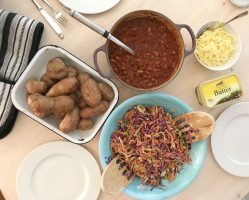 I love slaw for its ability to brighten up a meal, serving it with a gutsy meat or veggie stew brings contrast of texture, flavour, colour and temperature – all the things that make a meal more delicious and balanced. 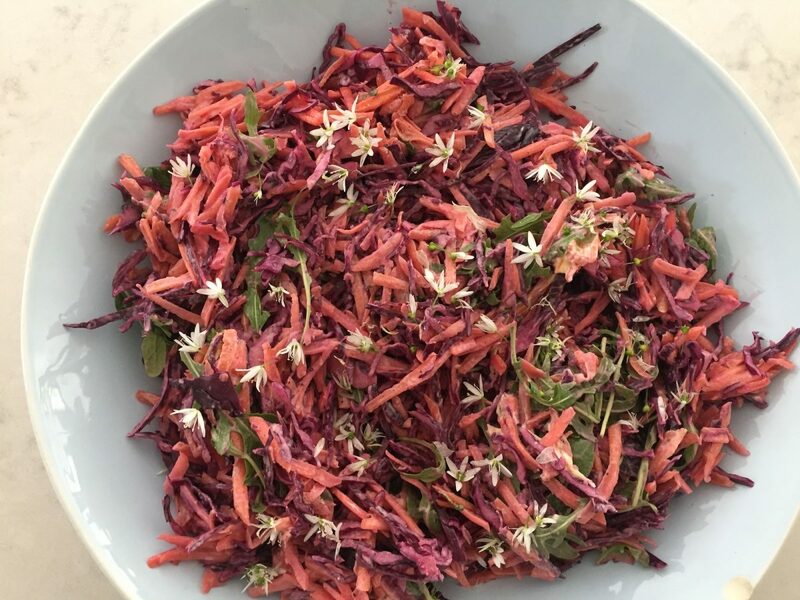 I also love it as a hearty veg-packed lunch, often I’ll make myself a big batch of undressed slaw, keep it in the fridge and grab some out each day for 3 days. Then I can dress it with a different dressing each day (to avoid groundhog lunch syndrome), add leftover meat or fish, avocado, seeds or a can of tuna and I’m good to go. If you follow me on Instagram, you’ll see me posting a slaw-based lunch most days. A slaw is, of course, just a short, some may say lazy, name for coleslaw. I choose the shortened name, in part, to distance this from that horrible supermarket stuff, the only coleslaw I knew as a child. The bought stuff has a dressing that manages at once to be both overly sweet and overly sharp, and always has so much raw onion. I hate raw onion with a passion. 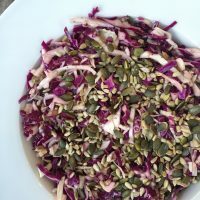 My slaw will never contain raw onion but is always jam-packed with colourful, crunchy veg and a dressing that I can adjust to suit the occasion. We all know the health benefits of eating raw veg, but without some serious chopping, a pile of raw veg can take an age to get through and can give the eater a bit of jaw ache. So I always use my box grater (buy one here in the US or the UK) or a sharp knife. The smaller the veg is chopped, grated or shredded, the less work your teeth and jaw need to do. Below I’ll tell you the best tool to chop each of the veggies I include. I’ve also made this video showing you how I use my box grater to get super-thin slivers without the hassle of getting the food processor set up and washed. I only tend to use my food processor for slaw if I’m making a huge quantity for a party. Rather than think of this as a recipe you need to follow, take the following building blocks and use them to make your own combinations. Think about what you’ll serve it with and that will usually give you the best steer on what flavours to add as a dressing. Scroll down for all my dressing recipes and a guide on what dressings go with what meals. The quantities below are to serve 4-6 people as a side dish – don’t stress about precision though. Just have a good mix of veg and taste the dressing once it is tossed through, adjusting the salt, heat and acid as needed. 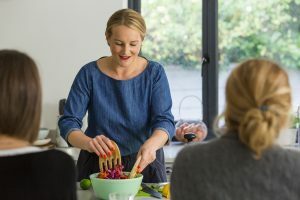 For a more traditional, creamy slaw – For 4 people as a side dish, I’d use around 2 heaped dessert spoons each of good mayonnaise and natural plain yoghurt, 1 flat dessert spoon of Dijon mustard and 1 flat dessert spoon of red or white wine vinegar. Try with my roast sausage and gnocchi. If I’m making a meal with a Mexican or Indian influence – say a chilli, tacos or a curry, I’d use lime juice and zest, finely chopped fresh chilli, olive oil, salt. Try my sweet potato and black bean chilli. For something more European – maybe roast chicken or grilled fish, or braised beans or meat, I’d use lemon juice and zest or sherry, white wine or wed wine vinegar, olive oil, salt and pepper. Try with my Spanish meatballs. Find all my other salad dressing recipes here. 3. taste and add more salt, heat (pepper/chilli/mustard) and acid (lemon/lime/vinegar) as needed. Dressing will taste different once it is mixed with your vegetables than it does on it’s own. Dressed slaw will go a bit soggy after a few hours, fine if you’re saving leftover slaw from dinner for your lunch the next day. If you want it to be at its best, dress it no more than two hours before serving. Find more recipes for salads, sides, and cabbage here.